I have a "Platinum" credit card ... don't ask me what this rare metal has to do with my credit, I think its kind of funny how these companies try to make their cards sound appealing. Capitalone was nice enough to let us put our own image on our card (Eli has already taken advantage of this) and so I decided to create my own exclusive club. 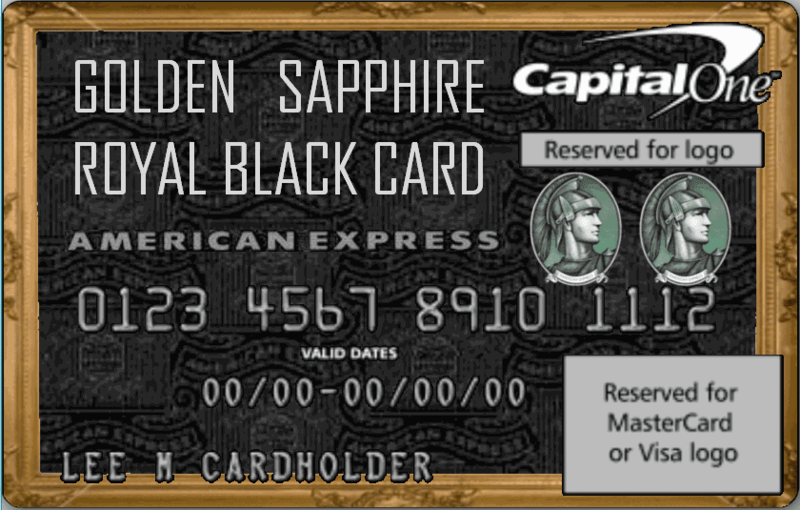 The invitation only "GOLDEN SAPPHIRE ROYAL BLACK CARD" with not one, but two AmEx Centurions. It also sports a gold encrusted wooden frame. The use of a competitor's logo is blatantly against the policy - but I'm hoping that my image will slip through the sensors (you will be sure to find out if it does). 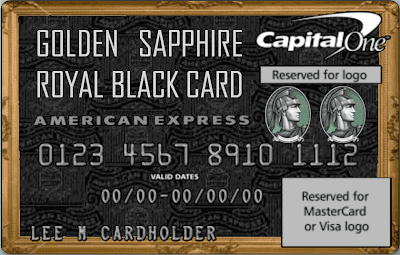 Once I get my card, I plan to try to get into luxury airport lounges, and act incredibly surprised at any business notaccepting credit cards even though I have a Golden Sapphire Royal Black Card. I would also be glad to receive any suggestions for more antics to pull off with this incredible card. Sorry the image you submitted for your Capital One® Image CardSM has been rejected. We will not approve any images that contain the following: Material that could infringe on the copyright or trademark rights of another party, including branded products, marks, or business names. Can anyone think of a good, exclusive-posh-sounding bank name? Maybe even a recommendation for an obnoxiously swanky looking logo not under copyright? I'd go with something like Royal Imperial Bank. 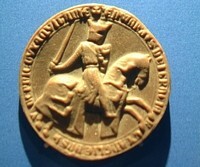 That would match the crown. Bonus point if you rant like Queen Victoria when the airline claims never to have heard of it. Shame they didn't accept it. I thought it was a pretty good looking design. There's so many bad looking credit cards out there today, but it's usually the simple ones that look the most "VIPish"